Isn’t it a shame that a very basic issue that repeatedly was a part of Hindi literature and films has always remained an incomprehensible subject for our elected rulers? I can reminisce the work of Munshi Premchand, Godaan, a Hindi novel, which revolves around a poor peasant, Hori and rural society, and depicts clearly the pain of borrowing from private moneylenders who never allow a farmer to prosper. Alike was the case with the family portrayed in Hindi film, Mother India, that though gained worldwide recognition but could not invoke a sense of duty in our lawmakers. Having lived a major part of my life in rural India and as a son of a farmer, I know the day-to-day hurdles and stigma, how a poor farmer borrows a mere 10 thousand rupees from Sahukaar to purchase a cow or to dig a water bore and the monthly interest rate of 10 per cent never lets this 10 thousand to be really paid off. We talk about APMC and government meddling with respect to selling off produce at least at minimum guarantee price, but do we know that a farmer cannot afford to wait for those cheques to be released, and the only way to get instant money to finance basic needs of daughter’s marriage and children’s fee is to part with the produce at rates much lower than the market price offered by local baniyas. The national capital, many a time, becomes the initiator of prime time news, protests, and this paves way for discussions, remorse and blame games. Won’t you agree, if the Nirbhaya case had not happened in Delhi, the after effects wouldn’t be same? Now the capital is again in the news, a mix of social disgrace, economic inequalities and political drama, for a happening that reproduced the tragedy of Indian farmers, who account for more than half of our working populace, yet are deprived of basic needs. Farmers’ pain, their suicides has for the very first time now become news headlines; the dialogues and interpretations, however, by so-called intellects and our chosen representatives revolve just around accusing other political parties for what happened during AAP’s protest, the cheques too have been handed over to the deceased farmer’s family, few aspirants of the parliament/ state legislatures have even shed tears, some have apologized for not behaving appropriately while being present at the cursed place. Now shall I not ask my politicians, who are so very moved, shaken and grief-struck after this suicide, to assure that no farmer of India would choose suicide as the most easily available escape route from bad weather and debt? Some are saying that AAP volunteers and leaders incited the deceased, others say that it was a gimmick that went wrong, some are saying that the suicide note wasn’t his, and most of us are indifferent, why because a farmer committing suicide is nothing new in our country, rainfall playing the villainous character. A place, where the producer of grains is such grimly depressed, can never become world’s superpower, even if we predict that the endeavors of the current PM would boost the economy markedly. While the Delhi suicide took away a son, a father and a husband, and almost every one of us has a feeling of sorrow running inside, let me remind you all that the National Crime Records Bureau of India reveals that 46 farmers intentionally end their lives every day in India. Records also tell that since 1995 more than 3 lakh farmers have opted for this unsolicited path; hence just noticing the incident of Delhi or the Parliament’s debate on the land acquisition bill would serve no purpose, of course until we find a constructive and non-politically driven solution, something that isn’t possible unless we diagnose the entire situation prudently. It isn’t only the weather that adds to the sorrow of agriculturists, in realism, it is the debt, more specifically, the money borrowed from private and unauthorized lenders that threatens the borrowers of social and financial humiliation. Then are the factors ranging from low produce value and pitiable irrigation facilities to high cost of inputs and indeed the deficiency of social infrastructure like toilets and schools. Studies have added to this endless list of causes reasons like no opportunities to earn alternative income, troubles in farming semi-arid sections, lenders’ priority to businesses over agrarians and also the curse of alcohol and other addictions. It is common that the interest on money extended by private lenders to already-bleeding farmers is exorbitant and collection of dues at the time of harvest leads to selling off the produce hastily at throwaway prices. The till-date measures by the central and state governments have proven ineffective in managing this issue and in infusing prosperity in the lives of farmers. Having focused only on credit and debt, political men have overlooked fundamentals like generation of income and productivity. What about the insult and even physical abuse of vulnerable farmers at the hands of Sahukaars, what about middlemen who take away all the profit, what about dropping water level, lack of private investment and India’s backwardness in terms of agricultural research? Now that a stressed farmer has brought the matter into high-level discussions having displayed the melancholy of grain producers in Delhi, it is expected that the law makers probe not only the death of one from lakhs, but also lay foundation for better lives of Indian farmers. 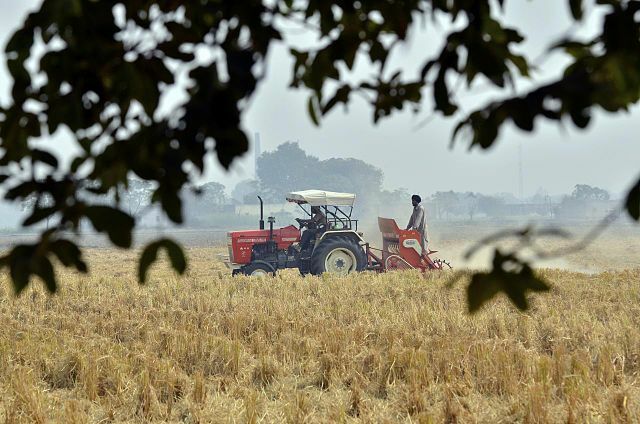 Also at this point in time, mention of the land acquisition bill placed in the ongoing session of parliament is evident, and the need is to assess the proposed changes diligently, not politically. This suicide also tells how our political leaders use a subject, which is so critical that a human doesn’t think twice prior to taking away self’s life, just to gain political mileage. Suicide by farmers is worldwide occurrence, but we cannot use this equation to cover up the flaws of our social, economic, environmental and political domains. The caretakers of GDP and inflation have to realize that agriculture’s share in GDP has constantly declined since 1951, and more than half of our workforce that is directly or indirectly dependent on this sector is scuffling to live a judicious life. Films in the past covered the despair of farmers, but this too has now become an outdated subject. The bottom line is that none of us relishing our lives at the stake of poor and vulnerable sections wants to feel the pain. The Delhi incident could have gathered attention, but it is yet to see whether it could invoke our sense of duty. Role of media, volunteers and political party/ leaders during the Delhi suicide incident can be deliberated by investigating agencies, but for law makers, it is time to assess ground concerns of our food providers in the parliament and boil down to concrete measures. No one who blames the Congress reign during past many decades for the misery of peasants is entirely off beam. Why isn’t a farmer able to borrow from legitimate sources at the time of harvest, their daughter’s marriage or when a cow is to be purchased? The actual picture of loans from government institutions is wicked where a farmer has to part with least 20 per cent of the sanctioned amount as illicit commission to broker and the bank official. Do not forget that the global warming and massive urbanization we worry about is an outcome of the members of farmers’ families shifting to cities for livelihood. To feel the pain, plant a tree outside your homes, give it water and care for it until it grows high, and one day when it would dry up, you would know why a farmer ends his life so easily when the crop is damaged and the borrowed money still runs high on interest and principal. Remember, sympathies find no answer when the issue is such grave and lives of the pillars of humanity, our farmers, are at risk. This entry was posted in blog on April 27, 2015 by admin. No one looks at ground facts. For input cost of 5000-6000 per beegha that government compensates only 500-1000 rupees, which PM has done 1.5 times now but will it help. Farmers have no life in India. There are some easy ways to stop farmer suicides. First the amonut of compensation should be increased and be timely given to the farmer in case of loss, second all farmers should be covered by crop damage insurance that should not lapse in case premium isnt paid. You will see that in next elections even BJP will not be supported the way it was in 2014. All farmers supported BJP last time hoping that Narendra Modi will do something for dying farmers but he has not done anything yet. Another reason not cited by writer is the corruption in government departments. Some farmers take insurance money on same piece of land again and again without even loss and others get nothing even after damage. wow I am really enjoying our blogs. Just yesterday a farmer couple committed suicide by lighting themselves up in fire. This is totally unacceptable and government should immediately come up with proposals to assure farmers of dignified life. mechanism to give insurance coverage to all farmers with one rupee premium be designed. Insurance money damaged crops should be given to the bank and the farmer at some ratio as bank lost principal and the farmer lost lively hood. Each Elected representatved to parliament and state assemblies should adopt a minimum of no of five farmers to facilitate entire process of smooth harvesting to profitable sales. Sir the real reason as you have mentioned is the money borrowed by helpless farmers from private lenders. And it should be told to all that such lending in India is now legal and such high interest rates can never be charged from anybody. We all worry about people who suffer death in calamities like flood and earthquake but avoidable situations like suicides are manageable. Here government must take quick measures. I just had to drop you a line to let you know that John and I think that the website is BRILLIANT!!!!!!!!!!!!!!!!!!!!!!!!!!! Well done. You know what a middleman in rural areas who buys produce from farmer can afford sending his children to private schools and engineering colleges but a farmer who does actual work on ground in sharp sunlight gets nil rewards. A spokesperson of BJP and you have the responsibility to prove that Congress did everything bad and BJP’s land acquisition bill is productive. You may be from a rural background but your writing is completely political and diplomatic. Modiji has to streamline the process of loan to peasants and the manner in which compensation and insurance premium is calculated. Small farmers should not be burdened with insurance premium, government should pay for them. Thanks for the marvelous posting! I genuinely enjoyed reading it, you are a great author. I will always bookmark your blog and will come back very soon. I want to encourage that you continue your great work,have a nice day! I just want to mention I am all new to weblog and truly savored this blog site. Likely I’m want to bookmark your blog . You actually have terrific articles. With thanks for sharing with us your web site. Hurrah, that is what I was seeking for, what a material! present here at this web site, thanks Dr gupta for this post. I’m very happy to find this web site. I wanted to thank you for your time due to this fantastic read!! I definitely liked every little bit of it and i also have you saved to fav to see new information in your site.